The Energizer Bunny called the Missourinet newsroom today. He was depressed. The ears were down. Clearly he wasn’t at full charge. We made him feel a little better when we suggested that it was unfair for him, an advertising icon, to compare himself with a politician who never quits running. Two different animals, we said. The only thing you really have in common is that you both beat the drum incessantly. “Thanks a lot,” said EB. We’re not sure where the EB is today (His authorized biography says he lives in St. Louis. ), but JN is beating the drum in Kansas City and Kirksville to talk about economic growth. Yesterday he was in Carthage, Springfield, Cape Girardeau and Arnold talking about making Missourians get prescriptions for over-the-counter cold and sinus medicines. Monday he was in St. Joseph and Macon announcing additional jobs. 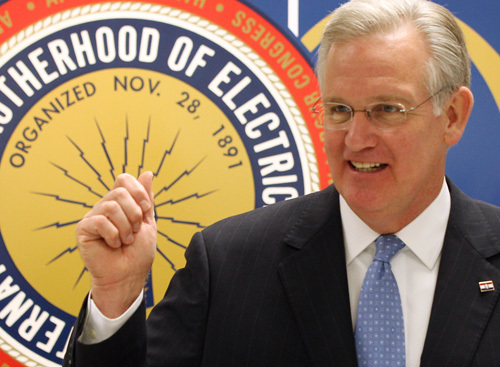 We should have reminded our the Energizer Bunny that another reason he has trouble keeping up with the Governor is that Governor Nixon can do something bunnies can’t do. This entry was posted in Politics and tagged Jay Nixon by Bob Priddy. Bookmark the permalink.